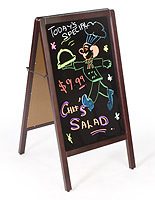 This Sidewalk Chalkboard Sign Has An Elegant Dark Brown Frame! 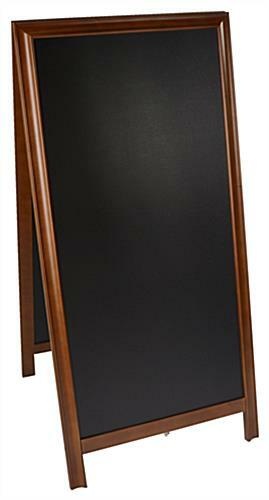 These Sandwich Boards Ship Quickly When In Stock! Each Sidewalk Chalkboard Sign Features An A-Frame Design To Showcase Multiple Advertisements At Once! Common Size: 20" x 42"
Wood frame with a brown finish to withstand years of use. 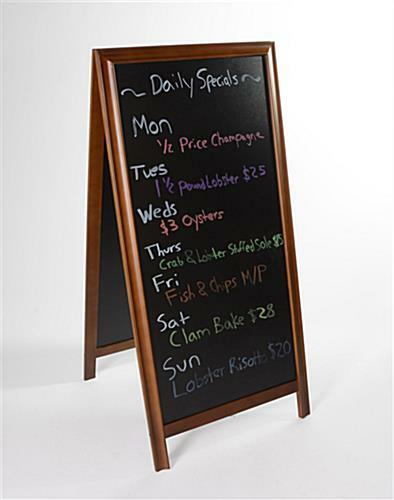 (2) 20" x 42" Blackboards draw attention from multiple directions. Designed for use with wet and dry chalk markers. 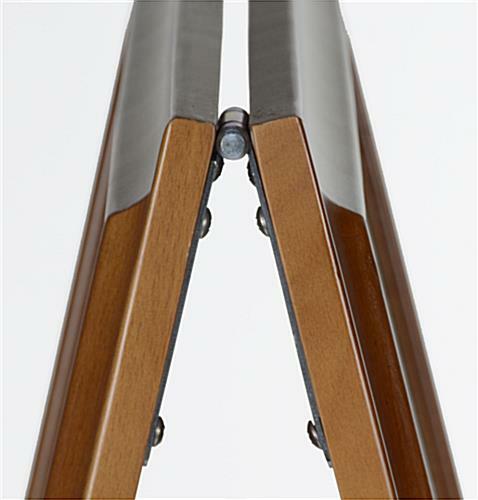 Top hinges enable unit to fold flat for simple storage and portability. Magic eraser included to remove even the toughest of spots. This sidewalk chalkboard sign is a great way to advertise for any establishment or event. This sandwich frame lets advertisers write and change messages in mere minutes. This sidewalk chalkboard sign that has an a-frame design is great for restaurants, retail stores, bars, night clubs, and more. This retail frame allows users to create their own custom messages. This double-sided sidewalk chalkboard sign makes advertisements visible to passerby coming from both directions. Display the same or different promotions on each side of this sandwich board. 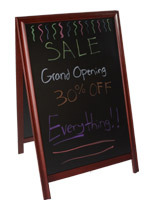 This sidewalk chalkboard sign that features a dark brown frame looks great in the entryway of any establishment. The attractive wood finish enables the frame to be used for a range of businesses. This write-on sidewalk chalkboard sign has (2) 20” x 42” writing areas. This message board provides more than enough room for users to craft their own custom advertisement. 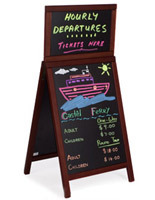 This sidewalk chalkboard sign that folds flat is easy to store and transport to events. Each sandwich board has hinges that enable the frame to quickly close and open. 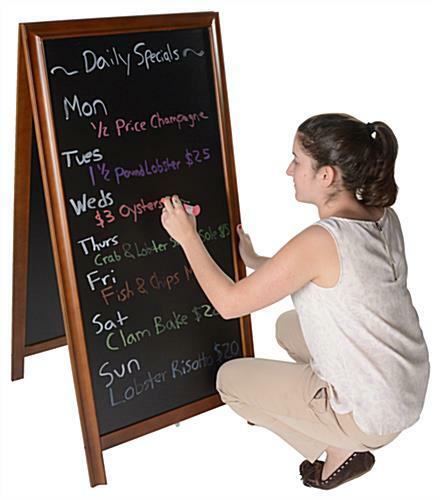 Use this sidewalk chalkboard sign to advertise new restaurant menus, grand openings, clearance sales, special promotions, and important announcements. This board features (2) black panels. 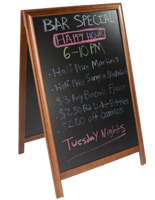 Write on these black panels with neon chalk markers to draw extra attention to advertisements. 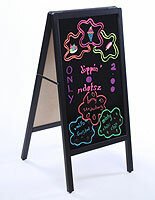 This two sided a-frame, sidewalk chalkboard sign comes with a magic eraser to remove tough marks. Wet or dry erase chalk markers work on this sandwich board. 24.9" x 51.4" x 3.5"